Do you love the color gray? There are really people who want everything in gray especially that it looks nice when paired with different colors. But there are also some people who consider gray as dry and dull, maybe because it is associated with gloom or sadness. However, gray is a lovely color and is one of the favorites of interior designers. You will notice that most modern spaces have gray touches in them. It looks good with pastel or bold colors and even with neutral colors like white. Some living rooms even make use of gray and white to create an inviting space. So, if you love gray, you don’t need to feel as gloomy as the color because you can actually apply that to your very own home! In today’s round up, you will get a glimpse of bedrooms that used gray beds. 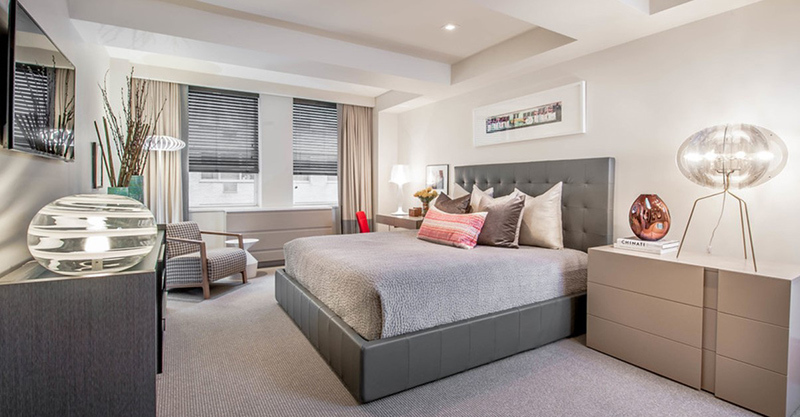 You will see how these gray beds look like in modern, contemporary and even transitional spaces! Oops! Don’t go yet! Scroll down and feast your eyes on how gray made the bedrooms appear cozier and even more relaxing. What got my eye in this space are the lamps on the side and that wing wall decor. But if you move your eyes around the bedroom, you can see that there are so many beautiful elements in here. And yes, gray is the main color. This bedroom receives a good amount of natural light from its balcony. 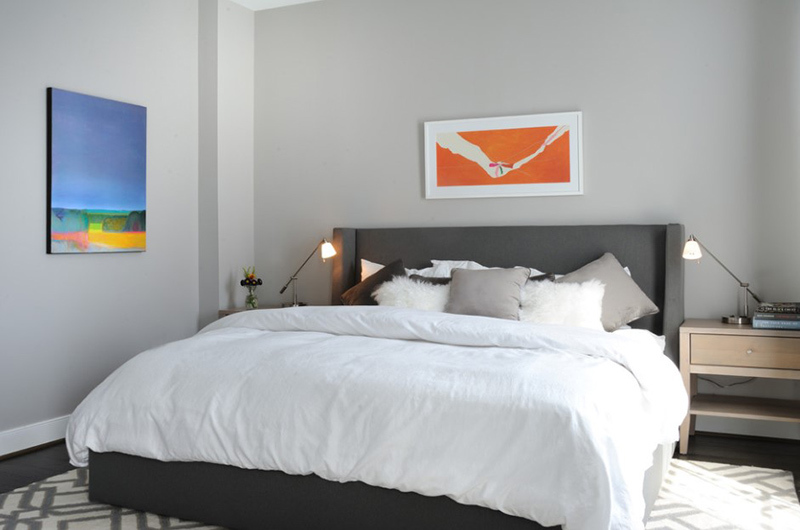 You can see the bed in gray and the solid colors in the printed photo above it that made this bedroom look strong. I love the colors of this bedroom! Aside from the gray bed, it used black and white as well. Very modern indeed! 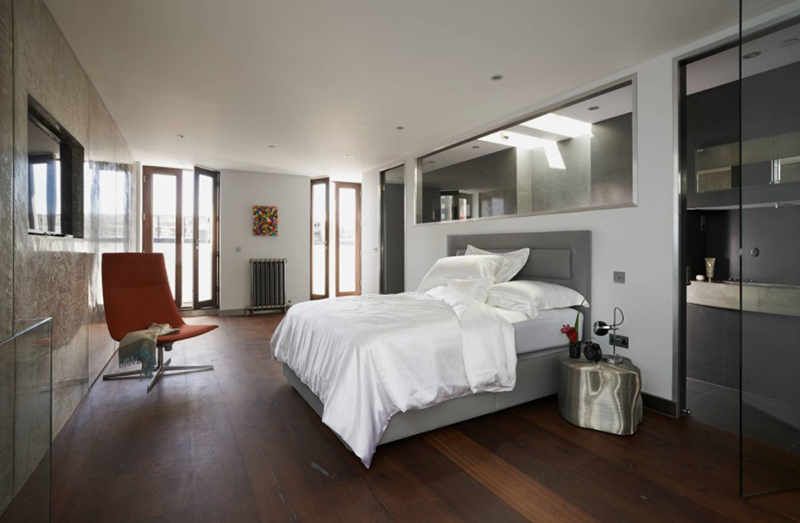 A dual-aspect master bedroom with bespoke glass screens which separate the en-suite bathroom from the bedroom. 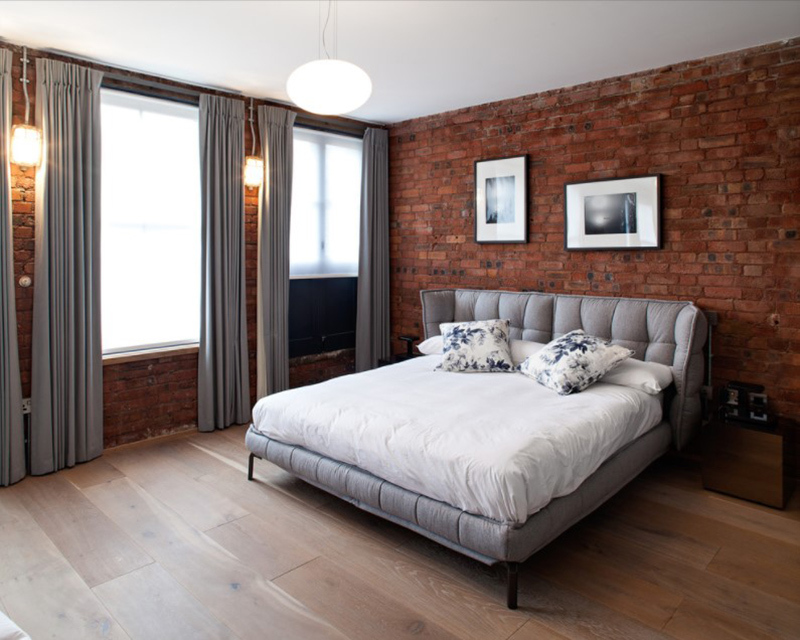 A bedroom with brick walls is always an eye candy. The gray bed looks nice with it especially that the design of the headboard is unique. Want to see more headboard ideas? Check out this list of masculine headboard ideas. 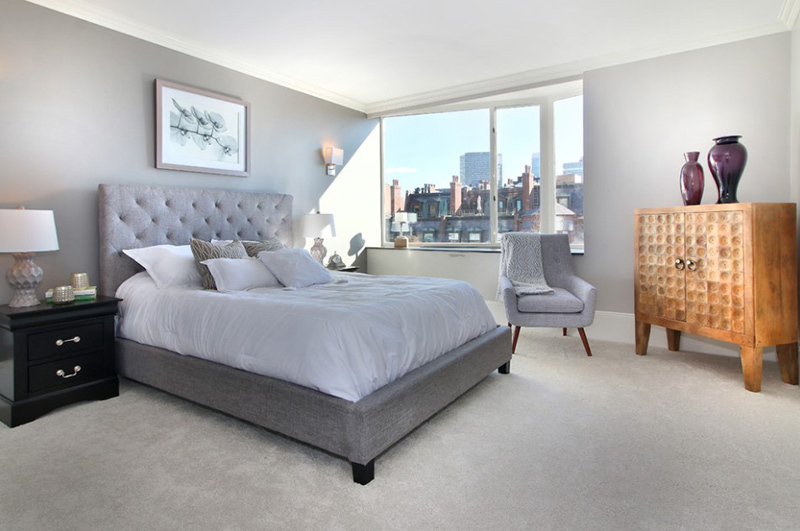 A bespoke bed in a contemporary space with gray colors in it from the bed to the drapes. 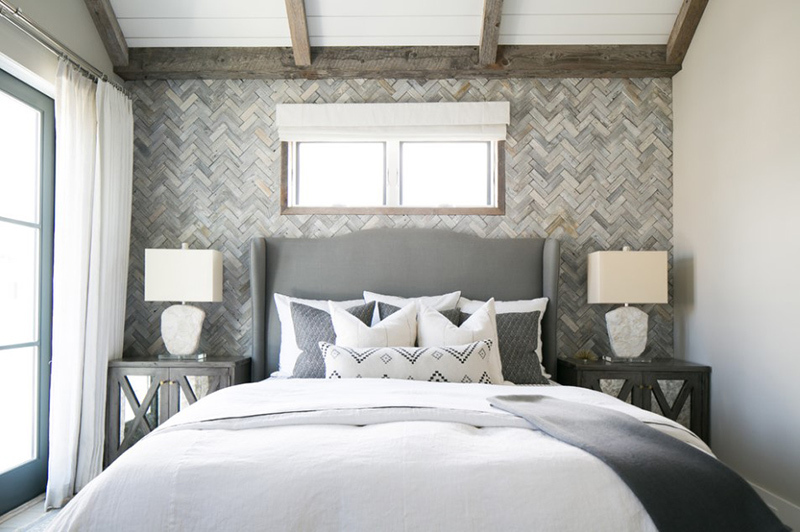 If you like the idea of using herringbone patterns, this one would be a good inspiration. Another interesting feature here is the headboard design and the side table lamps. A large transitional master bedroom with gray walls and dark hardwood floors. It looks really sophisticated and cozy. It is also a good idea to add flowers inside the room. Remember when I said that gray looks nice with light colors? Check out how this bedroom used yellow in it. I also love the decors in the bedroom too! 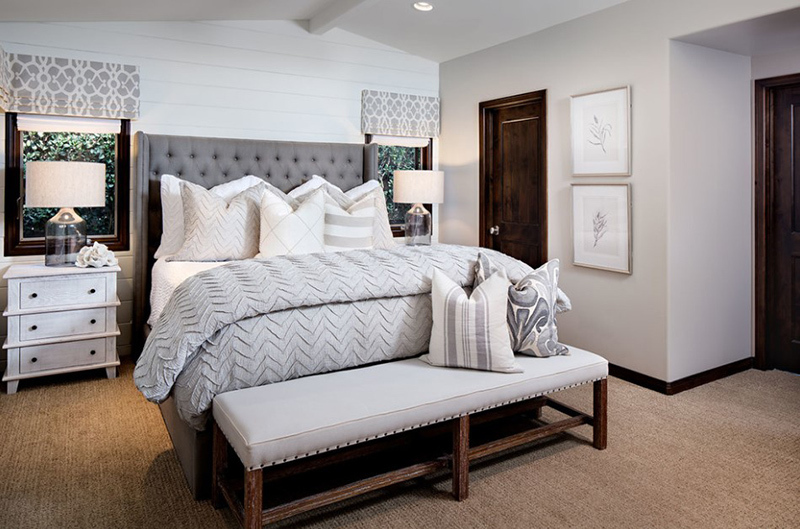 Rustic touches are incorporated in this modern bedroom which features a bathroom. It is also nice that the walls have textures on it. A boutique hotel-style bedroom with a crisp, smart look that offers a low-key luxe style that’s easy to live with. Paired with the plain bed are clean-lined neutrals in a blend of matt satin and Egyptian cotton sheets, pillowcases, and covers, and finish off with a merino wool blanket. 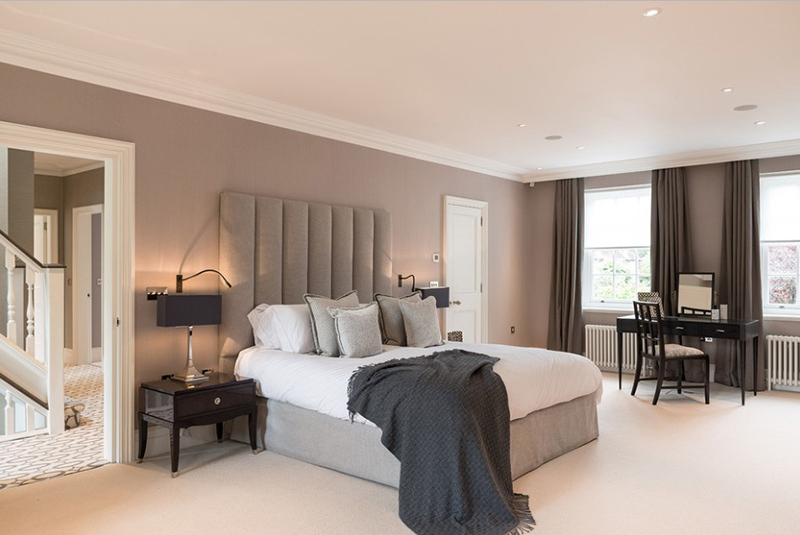 Neutral colors like brown, gray and white are used in this bedroom which is simple but stylish. The beige walls and dark hardwood floors look great together. 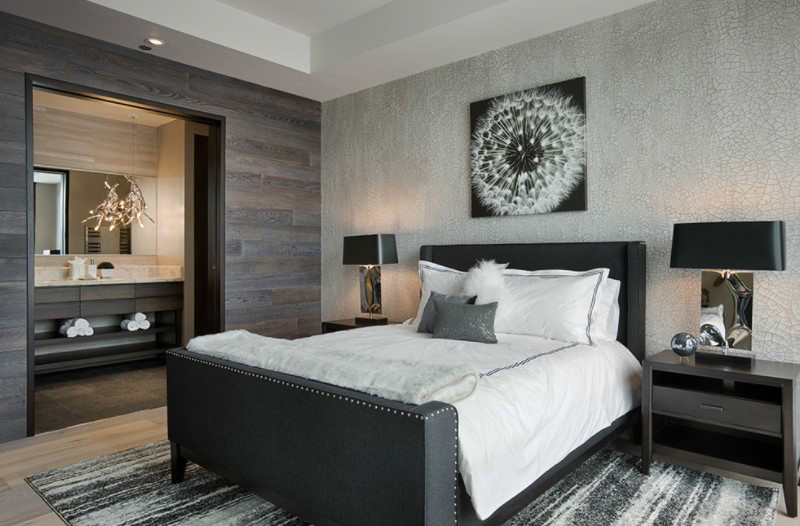 A large contemporary master bedroom featuring gray walls and medium tone hardwood floors. I like the idea of adding throw pillows in different textures to bring more depth to the area. 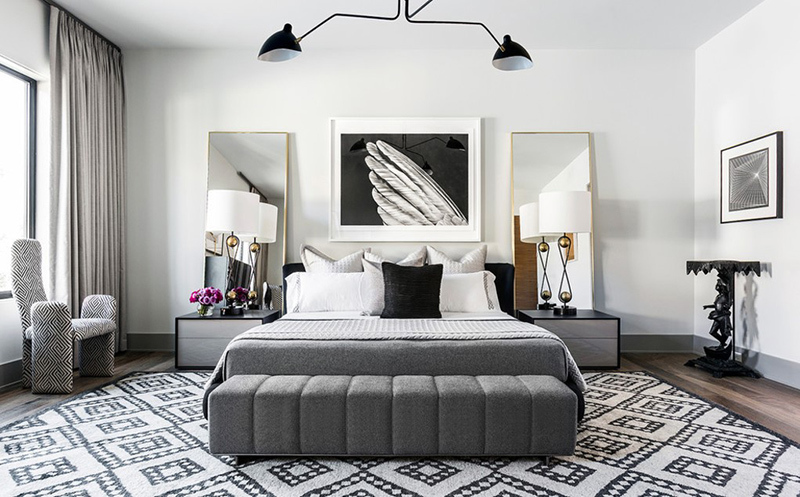 A modern yet cozy bedroom with gray walls and upholstered bed. Featured here is a wall art that provides color to the area. Also seen here are slender, adjustable table lamps that provide light. I love how this transitional bedroom looks like. 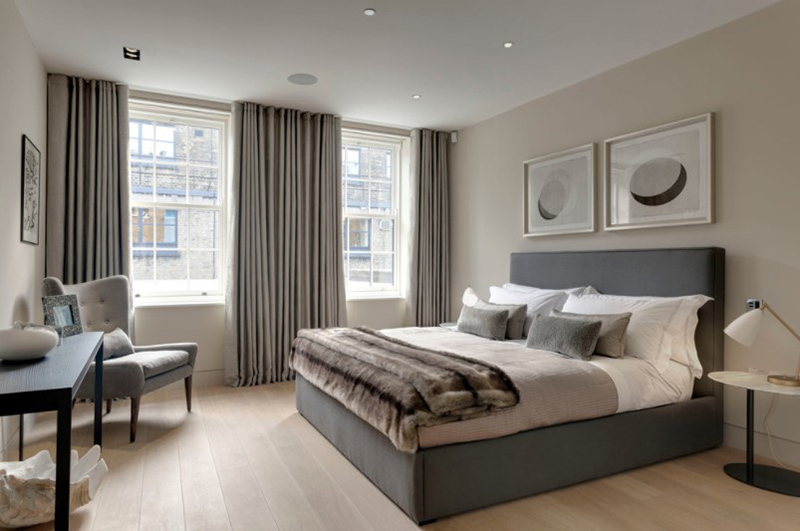 It apparently combines classic and contemporary style together creating a bedroom that is very pleasing to the eye! Aside from the gray bed and sofa at its foot, the built-in wall that leads to the ensuite looks interesting. Such a nice idea indeed for a bedroom. Notice how gray patterns create a lovely bedroom interior from the curtains to the tufted headboard. This trendy bedroom used a tall headboard that almost reaches the ceiling. It is reminiscent of a throne! 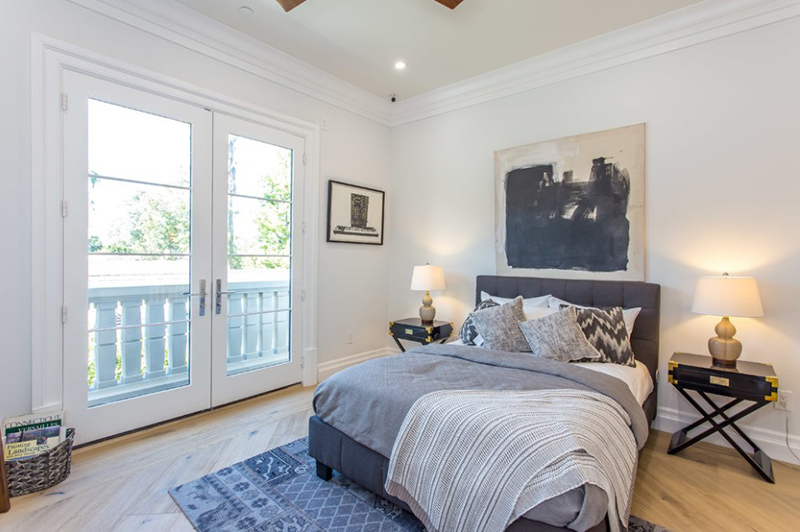 A contemporary master bedroom with luxurious touches from the bed to the lighting and everything in it! Isn’t this a lovely modern bedroom with gray walls, carpet, and gray floors? It is neat and one can get a good view of the city from here. After seeing the list, you will no doubt agree with me that gray beds look great in whatever type bedroom. Like white, you can also pair it with other colors. Although we didn’t see how it used pastels, gray actually looks very chic with pink like what we can see in these pink and gray bedrooms. Once you acquire a gray bed, do not hesitate to add colors to it. For sure, you will achieve a beautiful interior that is both attractive and relaxing! The 1st and 15th are my absolute favorites! All the rooms are super pretty but these two…. I think grey is a great color to style in interior decor as it can be with everything! Grey is gorgeous when incorporated with other colours. I have seen some gorgeous light grey velvet cushions with nice big diamontes on that look really pretty. 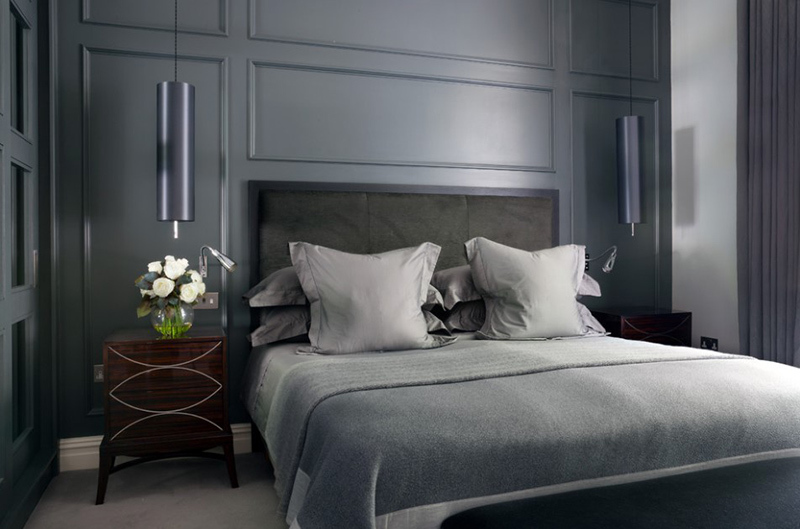 Grey can also look really classy and clean and can help balance out some other bolder colours in the room too! Gray can be a shade that’s either on the cool or warm side, depending on the exact shade. I veer towards the warmer shades of gray, and I definitely love the Florida pop of color! To be honest, grey is never my top choice when it comes to choosing colours. But yes, indeed you’re right that it actually make the room look really modern and fits both warm and cool side!